M0PLA/P SOTA Activations: 2nd December 2016. Stiperstones SOTA Activation visit. 2nd December 2016. Stiperstones SOTA Activation visit. G/WB-003 Stiperstones. 2nd December 2016. Still my first ever day of SOTA and my first ever visit to the Stiperstones, my son and daughter have been many times and always tried to get me to go. It was a pleasant walk up of about 25 minutes and John M0JZH thought I was mad carrying my 20M Moxon. I had used this on a few portable activation's over the past month or so and liked the results so I thought why not try it. The mast, beam and radio took around 25 - 30 minutes to assemble and get operational. I called out CQ SOTA on 20M for a good 5 - 10 minutes and had no joy, I was getting a little miffed and went over to how John was getting on with his 40M operation. He had already logged 5 or 6 calls, he said he would spot me using the SOTA App. I went back to my set up and logged 4 QSO's in 8 minutes including my first ever contact with the USA on the Moxon. I was then very pleased with it all. I have now downloaded the SOTA App on my own phone and find it very handy for spotting myself on HF activation's. 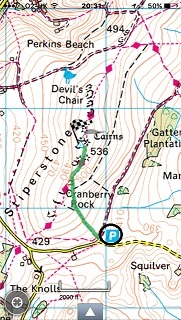 I have also downloaded and paid for the Outdoors GPS Offline OS Maps App and find it very useful. I strongly recommend it to anyone that is starting out like I am. It was not too expensive at £19.99 for a full years licence.